Nobody likes stuck nuts. Certainly not me, anyway. Sometimes, it’s just not possible to easily remove a nut by tapping it loose or by pulling it out of its slot. Sometimes, it just doesn’t want to budge and things can get risky if you try force the issue. Well, we don’t like to force stuff and we don’t like risky. So, to reduce ‘risky’, we have to move things towards annoying and fiddly. What we’re going to do is saw a slot across the length of the nut (from bass to treble sides). With the gap the new slot leaves us, we can collapse the two sides of the nut in on top of itself. We're cutting a slot ACROSS the nut's length. Crazy, eh? Here, I’m using one of Stew Mac’s gauged saws to cut a slot in the nut. 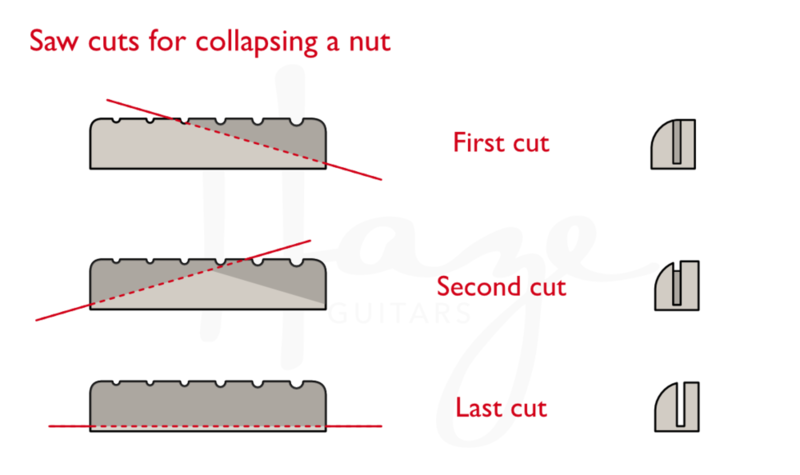 In theory, you can use any saw but it obviously needs to be small enough to be controllable in the narrow area of the nut. You don’t want it slipping off to hack the fingerboard or headstock (reducing risky, remember). I’d recommend these gauged saws, or a fret-slot saw, or what used to be called a gent’s saw when I was a lad (essentially a smaller tenon or dovetail saw). Something controllable is the order of the day. When you’re cutting, go slowly (always the slowly advice). Start with a bit of an angle down on one side. Then a bit of an angle on the other side, and finally take that little mountain in the middle down to meet the depth at either end. Don’t go all the way to the bottom of the nut as you risk cutting into the neck itself. Don't go right the way to the bottom — just close. 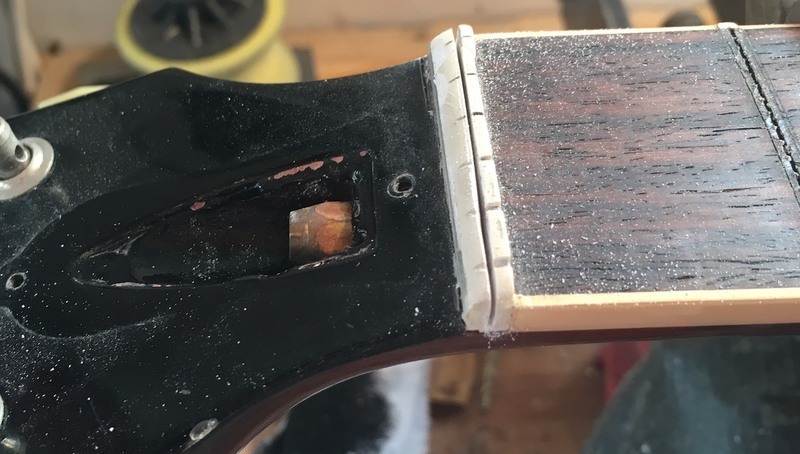 With your slot cut most of the way down the nut, you should be able to grip the nut with some pincers (fret cutters in this image) and apply pressure. If you’re lucky, it’ll collapse cleanly into a couple of pieces that are easily removed. If you’re not lucky, some pieces will easily remove and leave other bits wedged in the slot. That happens a lot. You'll often have to clean some stuck pieces from the slot. Then you need to try (carefully, so carefully) remove them. I’m using a dog-leg chisel here. A regular, narrow chisel can work too. Gently does it — no hammering or hacking. Oh, and do bear in mind that poking at bone or Tusq isn’t brilliant for a chisel so you’ll likely need to resharpen afterwards. 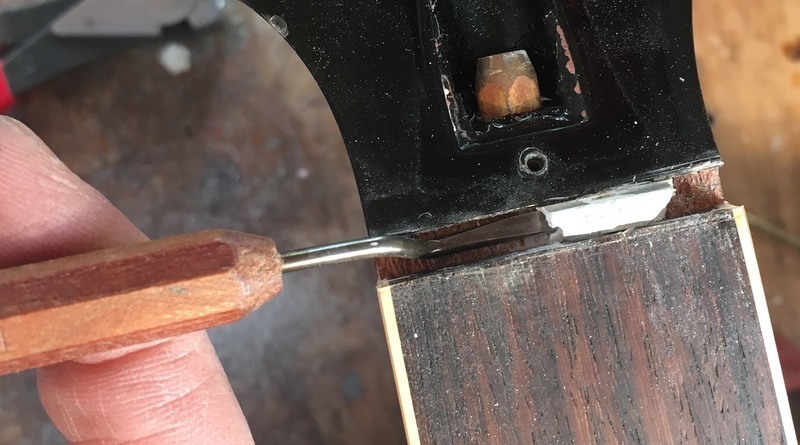 Take it easy so you don’t mar the floor or walls of the slot and beware of pushing any pieces out at either end of the slot as they can take pieces of lacquer finish with them on the way. You should end up with a number of broken nut-pieces and a slot in good shape. When you’re fitting your new nut, remember it should be snug but not wedged in so tightly the next guy needs to collapse it. And don’t deluge the slot in glue. You only need a tiny amount of glue to keep the nut in place. I use two small blobs of wood glue most of the time. You don't need a lot of glue to keep the nut in place. Really. So that’s all about collapsed nuts. This technique can get you out of a fix but do be careful when you’re doing it.